Wire Rope Corner: Did you know that there are different levels of rotation resistance in wire rope? Rotation-resistant rope is defined as stranded rope designed to generate reduced levels of torque and rotation when loaded and comprised of two or more layers of strands laid helically around the center, with the direction of lay of the outers strands being opposite to that of the underlying layer. However, there are different levels of rotation resistance to consider. 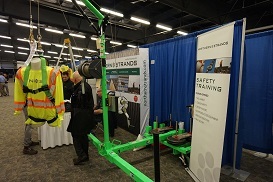 Rotation-resistant rope (Category 1): Stranded rope constructed so that it displays little or no tendency to rotate, or, if guided, transmits little or no torque. It has at least 15 outer strands and is comprised of at least three layers of strands laid helically over a center in two operations, with the direction of lay of the outer strands being opposite to that of the underlying layer. This rope is also known as Non-Rotating. Rotation-resistant rope (Category 2): Stranded rope constructed so that it has significant resistance to rotation. It has at least 10 outer strands and is comprised of two or more layers of strands laid helically over a center in two or three operations, with the direction of lay of the outer strands being opposite to that of the underlying layer. This rope is also known as Low Rotation. Rotation-resistant rope (Category 3): Stranded rope constructed so that it has limited resistance to rotation. It has no more than 9 outer strands and is comprised of two layers of strands laid helically over a center in two operations, with the direction of lay of the outer strands being opposite to that of the underlying layer. This rope is also known as Spin Resistant. Come back again in the near future for the next installment of Wire Rope Corner. Be safe out there.